On the morning September 11, 2001 I was riding in a route Taxi to Mandeville from my little roadside home in Porus, Jamaica. On the radio we heard the BBC man begin reports about the plane crashes in New York. I asked Driva to take me back home and for the next few weeks it was all that was talked about. I would live in Jamaica for two more years and effects of that day lingered like an oil spill. My mother served in the Peace Corps in Venezuela in the early 60’s. My father, a Venezuelan national, also worked for the Peace Corps and was trained in Canada in co-operatives. My entire life has been shaped the ideals around community organizing and on a more abstract level by international development ideals. We hope you enjoy this interview. It shines a light on an aspect of our surfing culture which for the most part lies in obscurity. Surfing for us is a personal endeavor but as we see here it can also serve as a tool for communities to come together to perhaps ensure a better economic, social and environmental future. 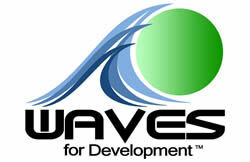 WAVES for Development (WAVES) was born out of a simple desire to connect surfing and sustainable development in the disadvantaged communities we surfed in Northern Peru. More specifically, make surfing available to youth who would otherwise not experience its joys and at the same time, use surfing as an educational tool. We wanted to help coastal community members find creative ways to directly benefit from surfing and surf tourism. Fortunately, Mark Kelly from Global Surf Industries (GSI) shared that vision. GSI donated 400 surfboards to the idea and shipped them to Peru. From there we built a team of surfers and professionals that use surfing to make the world a better place by complementing the education found in schools. In February of ’08 we offered a two-week pilot program where 13 international volunteers hailed from various countries to surf and serve. Following the pilot, swim and surf classes were continued by a local leader, hired by WAVES. In July we organized a team of international volunteers and offered another two-week program of English, environment, swim and surf classes. November 08 marked the beginning of ongoing volunteer programs, now available with start dates the first weekend of each month. We’ve completed our first successful year of Education Surf programs for local youth and Adventure Voluntourism programs for volunteers. Close to 40 volunteers have served roughly 150 youth of Lobitos, (approximately half the youth population) providing over 1000 volunteer-hours of instruction. Currently, we’ve registered not-for-profit organizations in Peru, Switzerland and the United States. WAVES changes lives through what we stand for W-ater, A-dventure, Voluntourism, E-ducation and S-ustainability. Q. Surfing as a community development tool – how does it work? Community development is a complex issue; we felt called to offer assistance but have focused on doing that in a sustainable and unique manner. For years, there have been many surfers who have visited impoverished communities and wanted to do something to create positive change but have rarely found an outlet for their desire to help other than sending $ or leaving a used surfboard for the local kids. We’ve created a structure for those good intentions which responds to locally identified needs using local resources. In the case of surfing in northern Peru, the resources are the waves and the people. For example, in Lobitos (a coastal community in northern Peru with world-class waves) during a participatory community analysis the school asked us for help with English and physical education classes. From that discussion the Education Surf program curriculum was born. The Educational Surf programs provide experiential opportunities for youth and include: swimming, surfing, English, conservation and entrepreneurship classes. These classes promote a healthy outlet for expression, an increased value of nature and skills to benefit from the constant flow of surf tourism to the area. The goal of the program is to develop local youth into healthy and empowered adults. A big part of program delivery is the involvement of international volunteers; for some, their very first exposure to community development and philanthropy. Traveling surfers assist with the classes in addition to enjoying the traditional elements of tourism. At WAVES, an experiential learning approach is taken where the volunteer travelers and youth learn by “doing”. A typical class starts with 10-15 minutes of English or environmental education on the beach. Activities include learning songs that build English vocabulary, discussing where waves come from and why plastics are harmful for our oceans. A swim or surf class follows. The Adventure Voluntourism programs strive to engage travelers with an interest in surfing and transform their world views through service. In addition to the international volunteers helping with classes, local youth ‘assistants’ also help lead the classes. Considered to be a training practicum for future leaders of the program, the assistants learn how to teach surfing and repair surfboards, skills that can be used both to teach visiting WAVES volunteers as well as other travelers visiting the area. Surf instruction and ding repair represents an income generation opportunity for local youth. Additionally, the youth assistants can learn to be guides to natural caves in the area, lead fishing tours or trips to surrounding communities where goat cheese is produced. We want to inspire youth to capitalize on existing resources as well as provide relevant tourism resources in the area. Cultural exchange is a key element in our foundation where learning and teaching are emphasized. Volunteers learn about local cuisine from the host family they stay with and have an opportunity to improve their Spanish language skills. Travelers teach English to interested community members and share their perspectives of their home country. Community members learn what surf tourists prefer and share their local culture. Consistency and a constant presence by WAVES builds trust and provides a sound structure for these learning opportunities. Q. Peru has an established surf history correct? Can you talk about indigenous (as in local vs. expats) surf cultures and how they mix with traditional cultural values around work/leisure, relationships to the ocean, religious views (as in waves on Sunday morning). (I remember talking with youths in mainland Mexico who didn’t surf because they had to work 10 hrs a day six days a week). Some go so far as to say the art of riding waves originated in Peru. The Trujillo area of Peru has a rich surf history evidenced by the cabillotos de tortora (reed boats) in Huanchaco and the long lefts of Chicama found in Puerto Malabrigo. The archeological sites in the area (Chan Chan, Huaca de la Luna, etc.) clearly depict waves and a connection to the ocean originating from the pre-Incan era. The original wave riding vehicles aided their fishing efforts, but I would venture to say there was a rewarding ‘leisure’ aspect to riding the waves into shore after a big catch as well. A modern day dilemma has risen (not only in Peru) pitting fisherman against surfers. When the surf’s up surfers are stoked, but fisherman have a harder time fishing.Â Their families go hungry. Jetties, fishing piers or other development projects destroy or threaten amazing waves (Herradura, Ancon, Cabo Blanco, El Nuro to name a few in Peru). I’m a proponent of finding the environmentally friendly common ground and focusing on that. Many of the locals in Lobitos fish in the morning and surf in the afternoon. That’s the kind of co-existence I’m talking about. 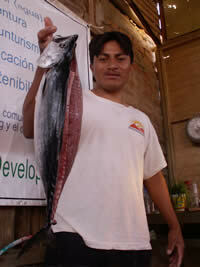 The guys who both surf and fish are the most interested in leading fishing tours when the waves are flat. We’d like to focus on how the economic impact of tourism can complement that of fishing, not be mutually exclusive. The Save the Waves Coalition is leading some exciting initiatives on the value of waves; a conversation very relevant in Peru. In addition to a rich surf history, thanks to the work of a dedicated group of individuals and the Peruvian Surfing Federation that dates back to June 6th of 2000 – Peru has enacted law (#27280) protecting waves ‘apt for surfing’ – the only of it’s kind in the world. Q. Can you talk a little about surfboard manufacturing (small scale) as a way to improve local economies and what are the environmental impacts/concerns? The idea of small scale surfboard manufacturing has a lot of potential. While a lot has been going on with wood lately, I can’t claim to be an expert; however, since the beginning of WAVES the idea of using Balsa wood to make surfboards has been entertained. The majority of balsa wood boards I’ve seen come from Ecuador. As one might imagine, balsa grows quite well in Peru too. Why not look at an entire supply chain operation for balsa? Sustainably grown balsa could be the base of small scale manufacturing – a driver for industry and further community development. By sustainable I mean: more trees planted than harvested, without the use of chemicals, processed locally, and workers paid a fair wage for labor. Obviously resins and glues still present environmental impacts/concerns; I’m anxiously awaiting the next breakthrough. Basically, we’re looking at what’s available locally (within Peru) and using that as a starting point. We’ve started preparing for such an endeavor by framing it as a progression. A renowned Peruvian shaper, Wayo Whilar, has helped train our local leader, Holggers, in glassing and repair techniques. Based on this experience a small scale repair business has been opened. For local youth this experience is presented as a social entrepreneurship learning opportunity. Much like a mentoring program for surf instruction assistants, interested youth are learning not only the repair and glassing techniques, but skills that can be applied to opening a business of their own related to the resources found in their backyard: amazing waves. In essence, we’re promoting vocational skills that empower economic development. Currently there are only a few small businesses that offer services geared directly toward the surfers that visit the area; even fewer opportunities to learn basic business skills. When a board gets dinged, we’d like to see them spend their money in a local shop where local youth benefit from the opportunity to do the repair job. Similarly, if someone wants a hand crafted wood board while making the pilgrimage to the world’s longest left, why not buy one from Peru? Q. Should there be a sense of social responsibility for traveling surfers? Definitely. Oftentimes focus is given to the great wave in front of the surfer, not the community behind them. WAVES values meaningful interactions with the people who live in wave blessed communities. Facilitating this connection is made easier by building trust over time and maintaining an ongoing presence in the area. Developing a model for this process is our goal. In addition to much hyped environmental concerns of traveling to communities, the economic, social and political impacts are equally important. Things we’re thinking about: How does WAVES work toward protecting the natural environment? What are the economic benefits to the community? How will the money be distributed? How is the local culture respected? What steps are taken to ensure community participation? Is what we’re doing politically acceptable? We’re responsible for providing adequate answers to these questions. We believe surf trips should benefit the people and communities where they take place; that travel should be experiential and transformative for travelers and locals. Q. Is there a plan for sustainable growth of surf tourism in the area? Is there a plan to look at carrying capacity for surf spots? How can this be monitored/ enforced? While the local government has a strategic plan for the area including surfing, we haven’t sensed it’s a priority. Not yet at least. In Lobitos, our flagship location, there are a number of power players with distinct interests including oil companies, the military and the local government. The economic impact from an increasing number of surf tourists is garnering more attention; however, to my knowledge it hasn’t influenced any master plans on the local, regional or national level. These are the conversations we’d like to facilitate local population involvement – so their voice is heard. What I can speak more definitively on is our philosophy and how it drives our actions as a surf-related humanitarian aid organization. We have identified 12 volunteers at one time as the carrying capacity for the program in the Lobitos community. Any more, we feel, could compromise the intimate experience for both the volunteers and the community members.Â San Diego State University professor Jess Ponting wrote an interesting paper on “Managing the Mentawais ” that addresses this topic better more in-depth than I can here. Other insightful academic perspectives on volunteer tourism, adventure travel and surf voluntourism come from: Stephen Wearing, John Swarbrooke, Christina Heyniger and David Clemmons. Monitoring and enforcement are difficult; but perhaps self regulation is the answer. On an industry level, there are some interesting evaluation instruments being developed by more established voluntourism operators. For example, there is a Voluntourism Effective Practices guide being led by WAVES colleague PEPY. We look forward to the unfolding conversation as it relates to surf voluntourism and carrying capacity. Meanwhile we strive to maintain a high self-imposed standard based on emerging best practices drawn from the growing voluntourism sector. Q. I wonder how corporate sponsorship from mega surf industry can impact local surf communities. Could there be adverse effects in terms of image of American surfer lifestyle versus the existence of a unique surf culture based on local traditions and waves and economies? As we’ve seen with GSI corporate sponsorship can have a positive impact on local surf communities. A big donation is one thing. Ongoing on-the-ground management is another. When the two come together there is potential for a powerful combination. Dr. Dave Jenkins and SurfAid seem to be on the right path for transforming mega surf industry donations into community health centers. Although changing, surfing largely remains a luxury sport in Peru. Finding the right balance between access and ‘surf colonialism’ is an interesting prospect. The approach matters. Dumping 50 surfboards into any one community with no attached programming doesn’t seem like a good idea anywhere.Â No ownership takes place; what motivation is there to care for the surfboards and not sell them? We’re taking a “give to gain” philosophy. Contrasted with a paternalistic ‘gift’ mentality, we prefer local youth do something – give time, energy, of themselves and then gain access to surfboards, instruction and life skills training. While not perfect, kids can learn more than how to surf; experiences they might not otherwise be afforded the opportunity to enjoy. Q. As a returned Peace Corps volunteer my views about “international development” have been shaped by those experiences. One of the key things that I learned was to be grateful for my own opportunities. But I also became a little cynical in the sense that I didn’t see my own society striving to make a change to help developing countries. However, we are always quick to tell developing countries how to better themselves. How do you see your role as a North American working in a developing country? Having served as a Peace Corps volunteer during parts of 7 different years in Africa and South America my views on international development have also very much been colored by those experiences. As surfers we don’t always get tagged as being ‘givers’. That’s okay. Not only has a green surfing movement begun, but I’d like to be a catalyst for a social surfing movement – one that engages people to take action through our shared passion for surfing. To quote a wise saying I recently saw on a friend’s email signature “It’s better to light one small candle than to curse the darkness”. In my own country, I’m an advocate for the majority of people in the world who don’t have the same privileges because of where they were born. I encourage people to use their senses and experience themselves the way that people live around the world. Inquire. Investigate. Listen. Do something to benefit those communities. Your own included. Volunteer with an organization that addresses an issue you care about in a way you’re comfortable with. Can’t volunteer? Put your hard earned dollars to work with on-the-ground organizations that are doing the work you’d like to. Q. What’s going on in Switzerland? While there aren’t too many waves for surfing in Switzerland, there are surfers! 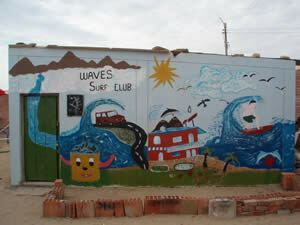 WAVES Switzerland was formed in February of 08 to create awareness and financially support WAVES programs in places like Peru. Currently a dedicated team is coordinating fundraising activities and awareness campaigns at universities and action sports events throughout the country. Volunteers hail from all over the world to participate in WAVES programs in Peru. Switzerland included. With a presence in Europe and North America WAVES can better reach out and connect with potential volunteers. Moreover, these affiliates in more traditionally developed countries that can raise awareness and provide support for WAVES affiliate programs in less developed communities around the world as the WAVES for Development idea is taken to scale.